Europa, one of Jupiter's moons, has long been thought to harbor water underneath its icy crust. New research suggests that water gets close to Europa's surface sometimes, but doesn't stay there long. Liquid water may be close to the moon's surface during some periods of time, but it migrates back downward after a few thousand years - the blink of an eye, in geological terms. Variations in gravitational pull from Jupiter produce the heat that temporarily melts the ice near the surface. Klára Kalousová from the University of Nantes in France and Charles University in Prague, Czech Republic, presented the research at the European Planetary Science Congress in Madrid last week. She said that while her findings show water only a few kilometers below the surface is likely on Europa, it disappears quickly. Kalousová mathematically modeled what liquid water and solid ice would do under various circumstances. Her research revealed that variations in density and viscosity caused liquid water to drift downward, eventually settling in the subsurface ocean. "It means that water episodes are brief," Kalousová explained. The ocean may be 20 to 50 kilometers (12 to 30 miles) below the surface. Liquid water could be present in more shallow areas, but would quickly travel deeper below the moon's surface. "One opinion in the scientific community has been if the ice shell is thick, that's bad for biology. That might mean the surface isn't communicating with the underlying ocean," said Britney Schmidt, postdoctoral fellow at the Institute for Geophysics, University of Texas, in a statement in 2011. "Now, we see evidence that it's a thick ice shell that can mix vigorously and new evidence for giant shallow lakes. That could make Europa and its ocean more habitable." Discovered by Galileo in 1610, Europa is one of Jupiter's largest moons. It is approximately the same size as Earth's moon and has an iron core, a rocky mantle, and a water shell with a depth of approximately 100 kilometers (60 miles) that lies beneath a bed of solid ice. Images of Europa show cracks on its surface, because tidal forces constantly shift the ocean under the ice that rests above it. 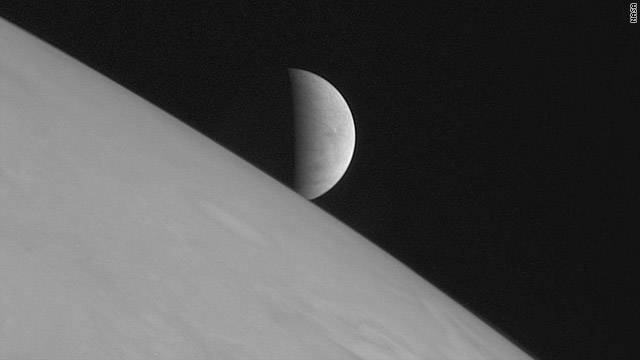 Europa orbits Jupiter every three and a half days. According to NASA, the warm temperature of Europa's ocean could be a reason for further research, particularly into the possibility of organisms dwelling in its waters. "Our results will help to understand the formation of different surface features observed on Europa, where liquid water may play a key role, as has been previously proposed," said Kalousová. "Moreover, if liquid water areas are discovered in the upper ice shell by a future exploration mission, our results would imply that they have been produced recently." So Europa sometimes passes water? China will be the first to make it into space, they may not come back but we will be there first. i would bet my rice patch on it. I would be amazed if we find microbes there. And we'll never know unless we try. Lets stop spending money on a global military empire and send a probe with drills there. It's so cool what science is doing nowadays. i was just dumbfounded when i read this!